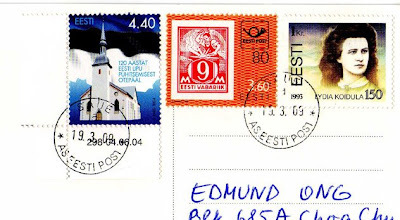 eD@HoMe: 2 marvelous postcards from Estonia! Good day! Here are 2 marvelous postcards from Estonia. 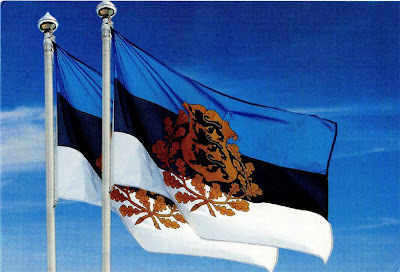 The first postcard shows the Estonian National flag. Great thanks to Janek! There are a number of interpretations attributed to the colours of the flag. A historical interpretation of the colours has blue representing ancient freedom, black symbolizing lost independence and white, the promise of a brighter future. white: hard work and other more abstract human values (Wikipedia) The left stamp on the postcard was issued on 4th June 2004 to commemorate the 120th Anniversary of the Consecration of the Estonian National Flag at Otepää. The other 2 stamps, both singles were issued in 1998 and 1993 respectively. Next, we have this lovely postcard sent from Baltic sea coast of Estonia. Many thanks Toivo! 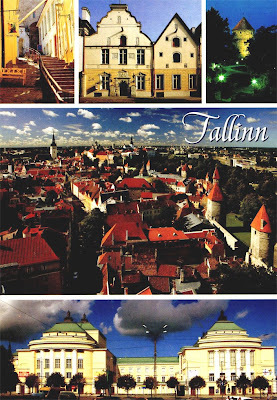 This beautiful postcard depicts the capital and largest city of Estonia, Tallinn. It is situated in the northwest part of the country on the Gulf of Finland opposite Helsinki, Finland. A major port, Tallinn was a possession of the Livonian Knights (1346–1561) and Sweden (1561–1710) before being formally ceded to Russia (1721). It became the capital of independent Estonia in 1919 and was the capital of the Estonian Soviet Socialist Republic (1940–1991). Today, Tallinn is a major commercial and fishing port, an industrial centre, and the cultural focus of Estonia, with numerous educational institutions. Historical structures include a medieval city wall and a 13th-century church. Tallinn's historic centre was designated a UNESCO World Heritage site in 1997. 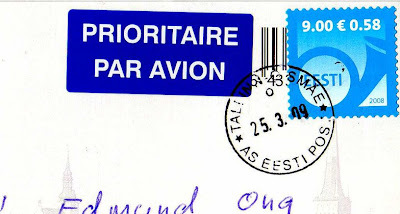 The stamp on the postcard belongs to the Posthorn Definitive, issued on 1st April 2008.